Trevor -- Well since we haven’t had a chance to do a good round of questions in a while, I’d like to pack this one full so the site visitors get caught up on things that are going on in the X-Men’s lives. Mike Marts -- Not a problem—let’s get to it! But before we do, I just want to say a quick “I’m sorry” for missing the last two MwM weekly installments. I’d like to say I was simply goofing off—but that just isn’t the case. We’ve been insanely busy at the House of Ideas, wrapping up HOUSE OF M, preparing for DECIMATION, and also holding one of our semi-annual top secret Creative Retreats! Our last retreat (which featured the likes of Brian Michael Bendis, Mark Millar, Jeph Loeb and Joe Quesada—just to name a few) was about two weeks ago, but the Marvel Bullpen is STILL buzzing around the great ideas that came out of the meeting. If you think 2005 was fun, you literally haven’t seen anything yet. 2006 is truly going to kick @$$. Trevor -- At the latest Retailer Summit, Marvel announced a load of new and exciting series’ that are coming out next year. 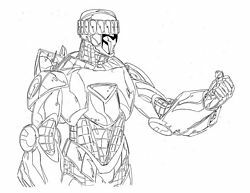 SENTINEL SQUAD O*N*E was an announcement that was made with John Layman and Aaron Lopresti heading up the project. Mike Marts -- Exactly. 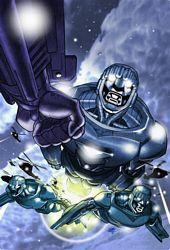 GAMBIT and HOUSE OF M: FANTASTIC FOUR writer John Layman and EXCALIBUR artist Aaron Lopresti have the distinct privilege of collaborating together on this special project which is very much a “Secret History of the X-Men Universe.” In this series, readers will discover what Sentinel Squad is, why it was created, and what its unique role within the Marvel Universe is. Trevor -- What’s the basis of this project? 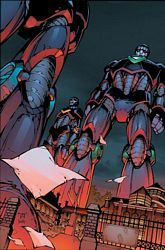 Mike Marts -- Well, it’s a little early to say exactly what SENTINEL SQUAD O*N*E is, but once readers see the shock ending of HOUSE OF M: THE DAY AFTER (on sale in just a few weeks), they’ll have a better idea of what’s in store. But don’t expect all of the answers to hit you in the HOM: DAY AFTER one-shot…hints will trickle in by way of the five issue SENTINEL SQUAD O*N*E series, plus most of the other monthly X-books in November and December. Trevor -- How much collaboration has gone into this book? Mike Marts -- An insane amount. Plans for SS1 started way back in April and May of this year. And the list of collaborators is almost as big as a Sentinel—Chris Claremont, Brian Michael Bendis, Peter Milligan, Tony Bedard, Craig Kyle, Chris Yost, Jim Calafiore, Salvador Larroca, Peter David, Ed Brubaker, Trevor Hairsine…all of these fine gentlemen have played some part in preparing the world for the coming of SENTINEL SQUAD O*N*E.
Trevor -- What characters (we know Val Cooper is one of them, but who else?) will be involved? 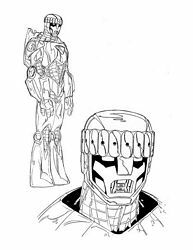 Mike Marts -- Besides Val, another EXTREMELY IMPORTANT MARVEL UNIVERSE CHARACTER will be involved in the series. Hint: like Val, this character has experience with the U.S. government and military…and with machines. Mike Marts -- Nope, I gotta stop you right there. I can’t say ANYTHING about The 198. Or they’ll take way my Mighty Marvel Marching Society membership card. Details to come. Seriously, folks. Okay, fine. Here’s one hint. 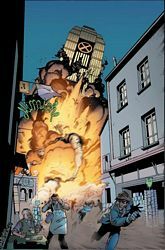 The number is important to the finale of HOUSE OF M.
Trevor -- Another book I’m sure you’ll have to be vague on, but hope your not is the Generation M mini that is coming out. Mike Marts -- My able associate editor Nick Lowe is editing GENERATION M, so I’m going to pass the mic over to Lil Nicky! Trevor -- We already know that Chamber and Jubilee are in the book. Who else is in the book? Nick Lowe -- Hey everybody! Good to be back on MwM! You’ll also be seeing the Blob, Stacy X and another MAJOR X-character that we’re keeping secret for now. Trevor -- What is the story behind this book and how did you guys come up with the idea for it? Nick Lowe -- As Mike has said, HOUSE OF M has some MAJOR ramifications in the X-Men part of the Marvel Universe, thus setting off DECIMATION. GENERATION M deals with a very specific part of the ramifications. I can’t go into detail (don’t want to ruin anything for you guys), but I can say this—The main crux of this story is a journalist named Sally Floyd and her reporting on the effects of House of M. It’s not completely unlike MARVELS, where we get a view into the Marvel Universe through non-super eyes. Paul Jenkins knocked it out of the park with this mini-series. It’s my favorite thing he’s written since THE INHUMANS. And when you see Ramon Bachs’ pencils you will be blown away.